Neeti and I landed in Hong Kong this morning. The uneventful journey from Bombay into Chep Lap Kok was quite uneventful. But I couldn't help but appreciate the serenity of Chep Lap Kok despite being the 13th busiest airport in the world. Despite the considerable distance between the aerobridge and the immigration counters, a series of escalators and inter-terminal trains helped us cover the distance in just about 10 minutes. The thought that has gone into designing the airport has undoubtedly increased the convenience factor manifold. Naturally, Chep Lap Kok had been consistently rated highly in airport rankings. After a few minutes in the immigration queue, it was our turn. The officer scanned our passports over and over again and asked us to follow him. We were ushered into the immigration office, a sterile, bare room resembling a hospital OPD. The room had quite a few people who appeared to be Indians, Pakistanis, Vietnamese and Filipinos. Our passports were handed over to an officer at the entrance. Neeti asked if there was any issue, if they needed any clarification, but we were tersely asked to wait, patiently. That was quite an insult. Despite feeling disgusted, we had no option but to wait a while. After about 10 minutes, a lady officer summoned me. I was asked to explain why I was in Hong Kong. Explanations were not enough, we had to produce documentary evidence - details of hotel bookings, return tickets, proof of employment in India, besides the Hong Kong Dollars that we were carrying alongwith credit cards. The lady took her own time to xerox all the documents. What the hell was she upto? After another 10 - 15 minutes of waiting in the "hospital - like" environment, we were ushered out to the immigration counters, where our passports were stamped with 14-day visa, no further questions asked, thankfully. No explanations were offered either, for why we were detained. Aren't Indians entitled to a 14 day visa on arrival in Hong Kong? Wasn't I a bona-fide business visitor? Aren't HKD 9,000 sufficient for me in addition to my credit cards? Or was it my support for the Dalai Lama and the Tibetan cause on my blog, the real issue? I still haven't been able to figure out. We proceeded to the baggage claim area without saying a word to the officer or each other, both of us were feeling very insulted. 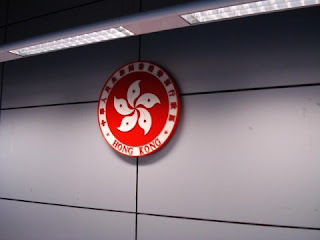 As we took the Airport Express into downtown Hong Kong, I realised that I could have been a victim of some kind of racial profiling of sorts, the kind of stuff even our politicians and celebrities have gone through. I dream of the day when such insults will be things of the past, when Indians would not need any visas to travel anywhere, when Indian Rupees would be the preferred currency the worldover, on lines of the US Dollar, the Euro or the Pound Sterling. Till then, and more immediately tomorrow, spare me further interrogation by the Immigration Department of Hong Kong SAR, when we leave for a day trip to Macau. Thanks to the Immigration Department of Hong Kong SAR, we had a grand welcome into Hong Kong!